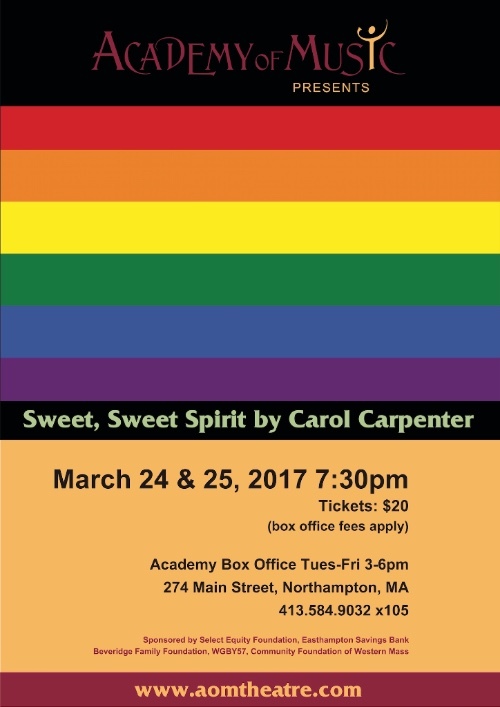 Sweet Sweet Spirit opens tomorrow evening at the Academy of Music. You can read more about it in Chris Rohmann's Valley Advocate article. And see the listing below for more information on the show and purchasing tickets. 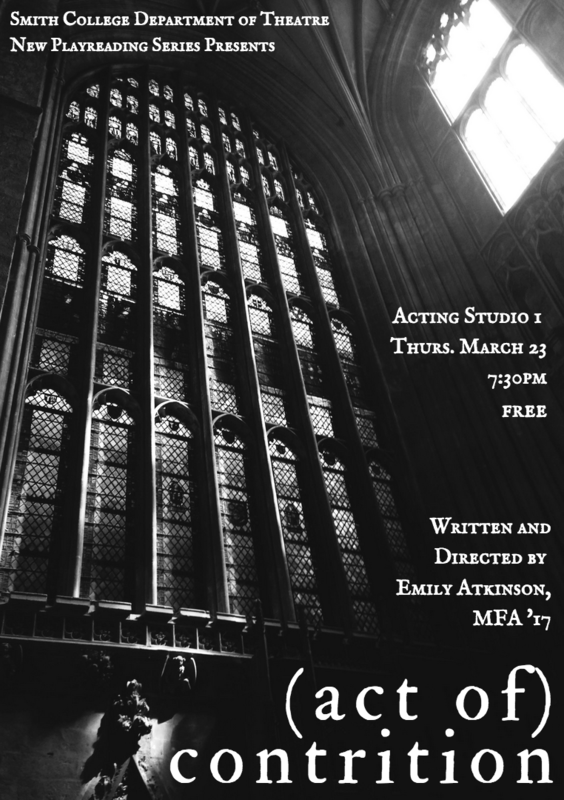 I'm stage managing and tomorrow is my birthday - so come check it out! 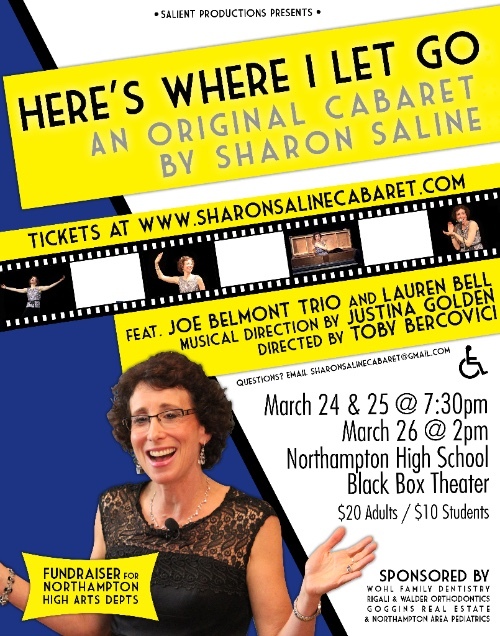 Sharon Saline is also presenting her new cabaret performance this weekend as a benefit for the Fine & Performing Arts Departments of Northampton High School. More information below! Mysticism represents the energy which drives, as well as unites all traditional spiritual paths. Mysticism characterizes the singular spiritual yearning at the heart of being. More importantly, mysticism represents the place where all sacred paths are in agreement: it denotes the human religion, shared by all. Kit Marlowe is dead. A knife to the eye in a Deptford tavern ended his dual careers in espionage and the theatre in a single blow. But there are some things that aren't so easily killed, and some stories that are not so easily finished. Kit Marlowe is dead, but the last act of his life is far from over. The Majestic Theater continues the celebration of its 20th season of live theater with the presentation of “Painting Churches,” a contemporary drama by Tina Howe. Winner of both the John Gassner Award and Best Off-Broadway Play, Painting Churches is set in a Beacon Hill townhouse owned by Fanny and Gardner Church. As the play opens, they are packing and planning to move to a beach home on Cape Cod. Their daughter, Mags, an artist who lives in New York, arrives to help — and to paint their portrait. Gardner, who has become frail, is also having memory problems and in his frustration recites poetry. Meanwhile, Fanny has trouble holding onto a thought, and Mags sees her role in the parent-child relationship changing. Cast members include Ellen Colton (Fanny Church), Anderson Matthews (Gardner Church) and Eve Passeltiner (Margaret Church). Rand Foerster is the director, and set design is by Greg Trochlil. Costume designer is Dawn McKay and Dan Rist is the lighting designer. Stage manager is Cate Damon and Stephen Petit is production manager. Ticket for the play range from $25-$30 and are available by calling or visiting the box office during its hours of operation, which are Monday through Friday10am – 5pm and Saturday 10am – 1pm. The phone number is (413) 747-7797. Carol Carpenter has written a moving and relevant story that illustrates the love and forgiveness that are possible when people can agree on what’s important. The story focuses on a conservative, evangelical family that must address some difficult topics after the father nearly beats his gay son to death. It raises issues around the complexities of faith, culture, family and community in a rapidly changing world. Sweet, Sweet Spirit won the High Desert Play Festival in April 2012 and was also nominated for Best Reading at Planet Connections Festivity in 2011 (NYC). 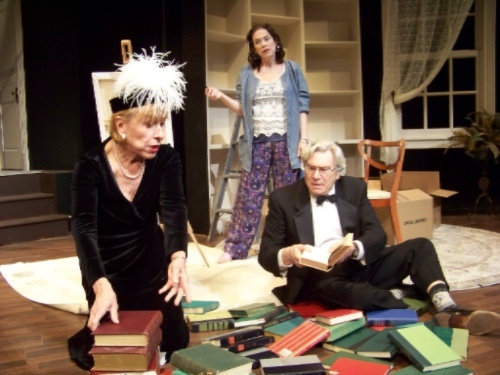 It was part of Acadiana Repertory Theater’s New Play series in June 2012, and was featured in Barrow Group’s 2012-2013 development series in New York City. The play was recently staged at the NYC 14th Street YMCA to sold out audiences. Proceeds will benefit the Academy of Music Theatre and their work with LGBT youth groups. An original cabaret show, Heres Where I Let Go, is a fundraiser for the Fine and Performing Arts Department at Northampton High School on March 24, 25 and 26. Using songs from musical theater, jazz standards and rock'n'roll as well as personal stories, Sharon creates a show that will have you laughing about life's crazy moments and touched by its more challenging ones. She brings together adults and youth to listen, laugh, and ponder our common human experience of living, loving, and learning. Sharon will be joined by the Joe Belmont Trio and Justina Golden, among others. The NHS Fine and Performing Arts Department offers a variety of opportunities for students interested in visual art, music and theater but lacks adequate funding. The proceeds from this show will support visiting artists, transportation to perform at local schools, assistance for the theaters new touring production and additional supplies for student murals in the building are essential to enrich both the students and the entire community. This show helps foster the creative endeavors of young people in these days of dwindling resources. 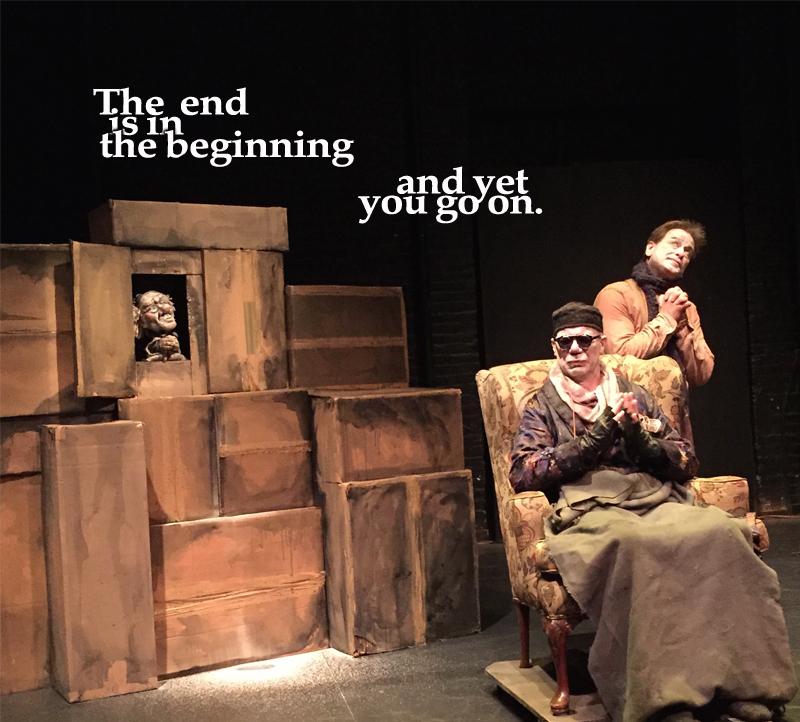 Serious Play Theatre Ensemble’s ENDGAME PROJECT played to sold out audiences last year here in the Pioneer Valley and many wonderful comments have been sent along about our version of Beckett's classic work. We are remounting the piece and presenting it again in Northampton, for touring in the fall of 2017. In Serious Play’s ENDGAME PROJECT, there is a desire to prolong the end by talking; repeating the same old jokes and stories, by repeating the same old questions and answers, in order to feel alive in a time of despair This is what resonated immediately with me as director, when rereading Beckett’s poetic and vital script over four years ago. I knew I had to collect the right actors and designers to mount this piece. I recognized that Beckett’s writing captured something honest and authentic about what it means to be human in an absurd world. I gathered a group of Serious Play theatre artists, all of whom would work collaboratively to develop Beckett’s play, exploring the fusion of acting and puppetry on stage. It fit my vision of the play to imagine the characters Nell & Nagg as puppets. The collaboration – with Ines Zeller and Eric Bass of Sandglass Theater, of Vermont, with physically trained actor Kermit Dunkelberg, Yale Drama School actor Rand Foerster, and puppeteer David Regan, a Sandglass Theater associate – was supported in part by a NET/TEN grant from the Network of Ensemble Theaters. We worked together to experiment with puppets as representative of Hamm’s memory world. Interweaving puppetry into the script, opened up new possibilities and interactions, that seem right in line with Beckett’s vision. Tickets: $15 Students & Seniors, $18 General Admission. Performances for ages 14 and up. Tickets will be available on brownpapertickets.com beginning March 1st. Facebook event. 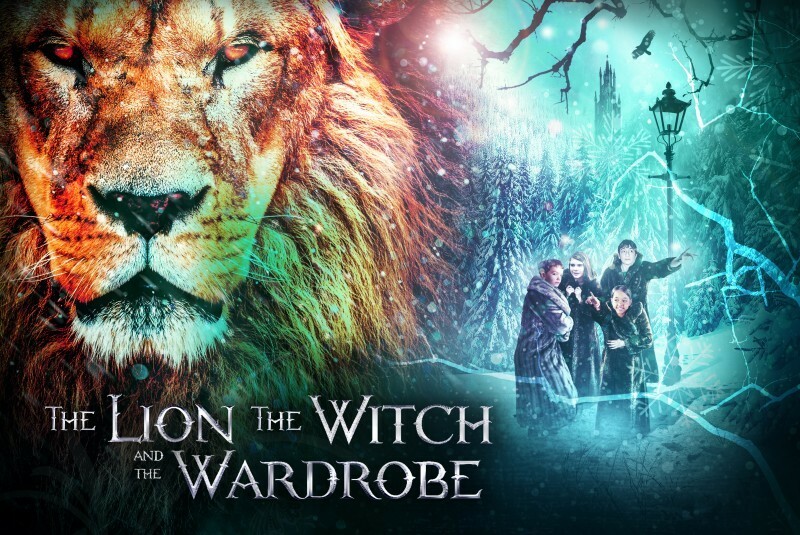 Open the wardrobe door and enter a spectacular new world with Peter, Susan, Edmund and Lucy as they journey through the enchanted land of Narnia! This dramatization of C.S. Lewis’ beloved Chronicles of Narnia series recreates the magic and mystery of the great lion, Aslan, his struggle with the malevolent White Witch, and the adventures of four children who very quickly find themselves in the middle of a deadly war between good and evil. Featuring breathtaking special effects, sweeping battle scenes, and all of the characters you love, rediscover this epic adventure of love, faith, courage and giving! Pre-show entertainment for the entire family is just a sleigh ride away! Slide by 45 minutes before each performance to build your own lion mask, create a shield for fighting evil, color in your favorite characters, and hear an abridged retelling of this beloved C.S. Lewis tale. Be sure to visit Tumnus’ Trove of Faun-tastic Treats for show-related snacks! Following each performance, there will be a meet and greet with the characters. 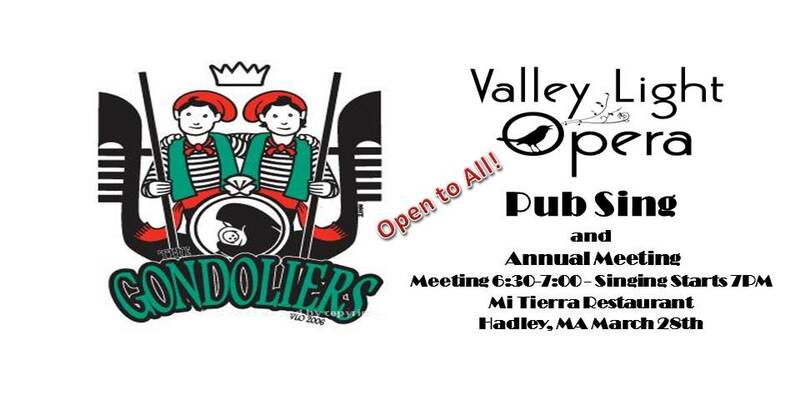 Join us for a Valley Light Opera Pub Sing at their Annual Meeting where we will present a music-only version of Gilbert and Sullivan's The Gondoliers. We provide the principals and our audience is invited to become part of the chorus! All are welcome - singers, non-singers and spectators alike. There will be a brief business meeting 6:30-7PM and singing starts at 7. Feel free to arrive early - drinks and food from a delicious full menu will be available throughout. The Gondoliers is full of spectacular music - so much so that there are no fewer than nine musical numbers until the first line of dialog! VLO pub sings are music only, performed without the dialog anyway, so things move rapidly along. Debuted on December 7, 1889, this was the twelfth operetta by Gilbert & Sullivan and is an international favorite. Plot Summary: The Operetta is centered around yet another Gilbertian "switched-at-birth" theme. The two most popular gondoliers in Venice are pursued by all the ladies,and so choose their brides in a game with blindfolds. The Grand Inquisitor arrives to announce that one of them has just become the King of Barataria (a small island nation), but only their foster mother, presently at large, knows which one. As Barataria needs a king to put down unrest in the country, they travel there to reign jointly, leaving their brand-new wives behind in Venice until the old lady can be interviewed. It turns out that the king was wed in infancy to the beautiful daughter of the Spanish Duke of Plaza-Toro, and so it seems he (whichever one it is) is an unintentional bigamist. Of course, the beautiful daughter is in love with a common servant! When the young Spaniard and the two Venetian wives all show up wanting to know which of them is queen, complications arise. No worries: The true identity of the king is revealed, and all is sorted out spectacularly well by the end. ANNUAL MEETING: The Board of Directors of the Valley Light Opera announces their 42nd annual meeting of the company at 6:30 p.m. on the 28th of March at Mi Tierra Restaurant . Members will vote on nominees for membership on the board, hear reports from outgoing President Kate Green, and discuss plans for the next production and other activities. Membership is not required to attend our event, but you can become a member at the Annual Meeting! Dues are $20 for an individual; $40 for a family, $10 for student. LIFE DEFYING ACTS by Pam Dickler: A tale of two sisters caught in throes of America’s epidemic wave of juvenile depression and young adult suicide, the toll and atonement, recrimination, recovery. New works are the lifeblood of the American theatre. As a part of UMass’ long tradition of fostering and presenting new works to central Massachusetts, the theatre department sponsors a Play Lab every year. Play Lab's mission is to help develop plays with bold and fresh forms that give voice to underrepresented communities and stories. 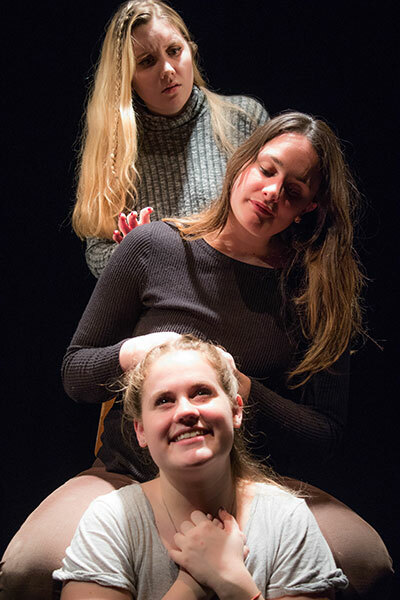 Through an intensive selection process, we pick one new script that speaks to our campus community, and offer the playwright the thing they need most: a roomful of talented artists who dedicate a fortnight to helping them polish their rough gem into a diamond. Audience members are vital to this endeavor because their feedback helps shape the future of these new plays. Come be part of a community that fosters new work. Black Cat Theater presents The 25th Annual Putnam County Spelling Bee! Performances are March 30-31, April 1 at 7:00 pm and April 2 at 2:00 pm. The 25th Annual Putnam County Spelling Bee has charmed audiences across the country with its effortless wit and humor. Featuring a fast-paced, wildly funny and touching book by Rachel Sheinkin and a truly fresh and vibrant score by William Finn. A riotous ride, complete with volunteer audience participation, The 25th Annual Putnam County Spelling Bee is a delightful den of comedic genius. Betsy Goldstein might finally get her play about her grandmother’s war heroism produced-- if only "HOLOCAUST SUPERSTAR: THE MUSICAL weren't just about to open. When Betsy learns that the upcoming musical has an oddly similar story line and was written by her former mentor, she must decide how far to go to protect her play and her beloved grandmother’s story. This month's super special guest is Peter Kim of Second City (Chicago). Peter Kim opens the show with his stand-up act, which he performs regularly at the Laugh Factory in Chicago. Peter has been featured in the Oddball Comedy Fest, hosts The Moth at Lincoln Hall, and has been called "a master storyteller at work" by the Chicago Tribune. 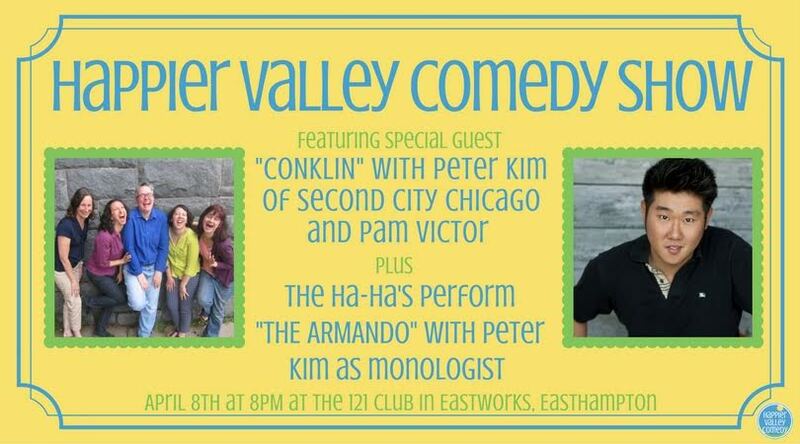 Then Peter joins Happier Valley Comedy's Head of Happiness, Pam Victor, as they debut their two-person improv show, "Conklin." Pam and Peter first met at the iO Summer Intensive in 2012 and instantly fell in love with each other's hot nasty 'prov action ..."Conklin" is their love baby. Second City Chicago's Peter Kim is the monologist for the The Ha-Ha's. The Armando is a beautiful trail of inspiration! The audience gives a suggestion, which inspires Peter Kim's stories. And Peter's stories inspire The Ha-Ha's improvised scenes. And the show inspires the audience to laugh a lot. It's the cycle of laughter! Tickets: $13 at the door, $10 in advance online. For more info: www.happiervalley.com. Open improv jam for everyone and anyone to play and watch improv games, plus a showcase set featuring up-and-coming improv team LIVE in the '70s. Free show (one drink minimum). For more info: www.happiervalley.com. This is a staged reading. Props and sets should be minimal and provided by the Playwright. The Cuckoo Clock Master's Apprentice is an original play with both human actors and puppets. It follows the coming of age journey of the main character, Compass Rose, who enters the outside world only to discover it is bent on erasing their own history. Come any time between 1pm and 4pm to audition for one of these four main parts. No acting or puppeteering experience necessary! All ages welcome. Snacks provided! Ghost Light Theater presents its second Zombie Prom, this time an underwater adventure! Terror at the Bottom of the Sea: an evening of pirate zombies, beach zombies, Lovecraftian zombies, squid zombies, you name it! All proceeds directly benefit Ghost Light Theater in its mission to produce works that entertain and challenge its audience. Tickets are $10! We'll be naming our prom King and Queen, Or King and King, or Queen and Queen. Be sure to dress to win! There will be games, cash bar & bistro, and all your prom songs. Stay tuned for more information about the activities and adventures that will be available that evening. We'll see you (and your brains) soon! Scheduling rehearsals and collaborating to create the tech and show pattern schedule. Running rehearsals with the director. Assembling and maintaining all records for the production, including the Prompt Book, cue sheets, plots, and daily records, including reports to the Producer on attendance, etc. Managing the timing and logistics of performance, including timing, cues, etc. Working with the Director and the Producer after opening including preparation of the Understudies, Replacements, Extras as needed. The ideal candidate will be an experienced and creative team player dedicated to creating a sense of community in an organization that includes staff and volunteers. Because performances will be happening in repertory, the successful candidate will be detail oriented and have exceptional communications skills. Strong organizational skills and an ability to quickly problem-solve is a must. The ability to deal with stressful situations with grace, humor, and tact is essential. Candidates should have reliable transportation, leadership and conflict management experience, excellent communication skills, and enjoy working with young people under the age of 18. The ideal candidate will be excited to grow and develop with a small local theater committed to providing valuable experiences for those beginning their careers. Interested applicants should send a resume and cover letter in PDF format to Jessica Thompson, Producer at hampshire.shakespeare.company@gmail.com.